ADORA is a blend of carefully selected cleaners and emollients, specifically formulated for hand cleaning without removing the natural skin oils protecting the epidermis. This gentle lotion hand soap has the same pH as your skin and only a few drops will provide thick, and luxurious suds that lift away dirt and grime leaving your hands clean, fresh and velvet-smooth. ADORA can be used in industrial plants, schools, hotels, food plants, service stations, offices, restaurants, kitchens, and washrooms facilities. 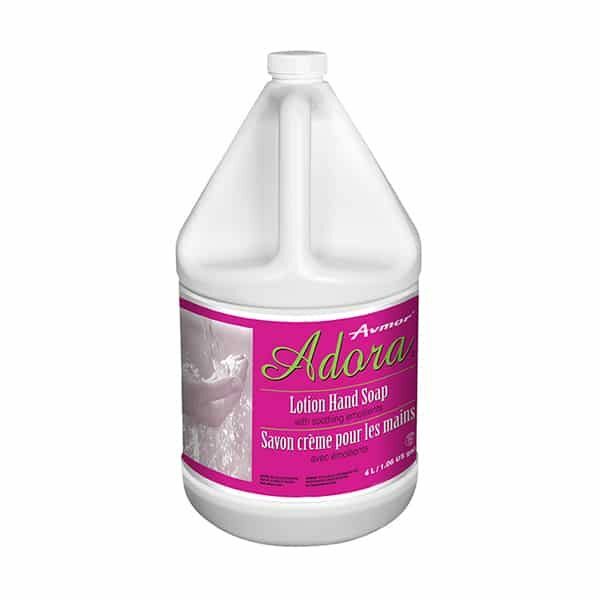 ADORA is effective in hard or soft water. Its attractive colour and refreshing fragrance make it a pleasure to wash up. Wet hands, apply a generous amount of ADORA Lotion Hand Soap and gently rub until a rich lather is produced. Rinse well before drying.